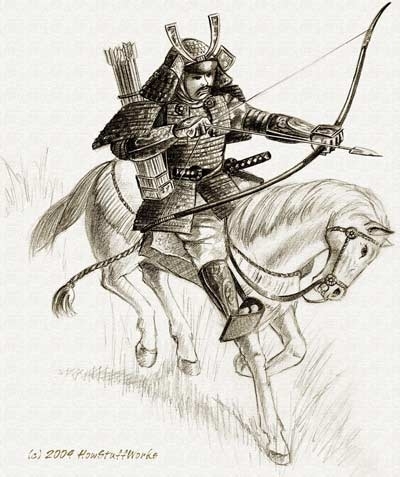 In case you were wondering, the guy in my blog header who is riding a horse and carrying a bow and arrow is a Samurai. But what is a Samurai, and why have I named my blog after one? The samurai were military nobility from the Feudal and pre-Industrial era of Japan. They basically were the Japanese equivalent of the European knight. Like the knights in Europe, the samurai swore fealty, or military service, to a lord, called a Daimyo, and in exchange were either granted land and property or else paid with rice, which often functioned as currency. Daimyos (who could also be samurai) in turn served the Shogun, who was basically the generalissimo and military dictator of Japan. While the samurai are most famous for being master swordsmen, most never became skilled with the sword, and instead remained highly trained and effective horse archers, as well as being handy with the spear and glaive (called a naginata in Japanese). As the centuries progressed, a code of honor called Bushido, similar to chivalry in Europe, began to develop among the samurai. For most of feudal Japan, different factions or states, usually divided along family lines, were constantly warring for power. Because of this, samurai were trained to serve their Daimyo completely, even if it meant certain death. Their code of honor became very fatalistic and stressed that defeat was not an option. If a samurai was dishonored by defeat, capture, or if they failed in a military coup, they were often forced to commit Seppuku, which was an extremely painful form of ritual suicide. If for some reason a samurai failed to serve his Daimyo, or if his Daimyo died, a samurai was supposed to commit Seppuku. If he chose not to do so, he broke the Bushido code and was without honor, in which case he would become a rōnin, a shamed and landless noble. Often, rōnin became mercenaries, warriors willing to fight for payment. While I do not condone fatalism or suicide, Bushido makes a good illustration of the self-sacrificial devotion that Christians have to Christ, and so I have used the idea of a samurai serving his lord as a title for my blog demonstrating how I serve my Savior (and I have spelled Savior the British way, Saviour, because it looks more cool that way). But what happened to the Samurai? Well, eventually the various warring factions of feudal Japan were united under the Shogunate of the Tokugawa family. It is during this subsequent period of relative peace that much of Bushido was developed to its fullest extent. As the samurai no longer needed to fight, they could instead instead read, practice calligraphy, paint, and engage in philosophy, among other academic pursuits, and also codify their values. The feudal period of Japan continued into the 19th century, but was gradually replaced by reforms to modernize and industrialize Japan. The samurai eventually were abolished in the late 1800s in the Meiji period, though some resisted in what was the last major rebellion against the Japanese government, the Satsuma Rebellion. Following this conflict, the samurai effectively ceased to exist, and Japan soon industrialized to become one of the major world powers of the early 20th century.